Write what is hardest to say, my poetry instructor in grad school used to urge us, and Suzanne Richardson Harvey does precisely that. 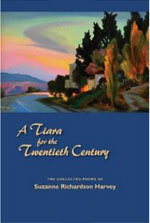 In A Tiara for the Twentieth Century: The Collected Poems of Suzanne Richardson Harvey, the poet tackles subjects ranging from motherhood, family relationships and aging to bulimia, AIDS and homelessness. While a free verse poem, there is nonetheless an almost implicit meter: the insistent beat of these lines mimics the rhythmic stages of birth. You could mold that into magic. Through this repetition, she captures the compulsion which drives the central character of the poem. Such deft choices contribute to this collection’s success. Rather than taking easy outs of lapsing into abstracts, Harvey meets each subject head on, distilling it into essential moments and imagery. In each case, she finds the language to communicate truths in a powerful, specific and often tactile way. Are blank as a forgotten Christmas tag. With this collection, Harvey, whose work has appeared in Wild Violet, has indeed crafted a tiara, a delicate coronet crafted from years of skillful, intuitive use of language. Disclosure: A review copy of the book was provided by the publisher.